Trains Today: If all else has failed... bring out the 'Short Set'! If all else has failed... bring out the 'Short Set'! In the UK in 2013 the thought of a locomotive hauled train is rare enough- but the thought of a loco hauled train with just two passenger coaches is almost inconceivable! Desperate times however call for desperate measures. Greater Anglia is in the grips of a severe shortage of DMU's with trains being short formed or even being replaced (or supplemented!) with buses. It has been a number of years now that Norwich Crown Point depot has had to juggle its small mixed fleet of DMU's to maintain a service and there never seems to be any spare floating around. Recently with a couple of extra DMU's out of service for maintenance or repair the situation has reached breaking point- there are simply not enough units to maintain the service. Time to call in the 'Short Set'. The so called 'Short Set' is formed from part of a London-Norwich Mk3 intercity set with two TSO coaches and the Driving Van Trailer. Either end of this short formation sits a class 47 diesel loco hired in from DRS to provide the power. 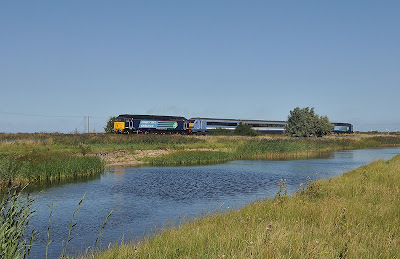 Many platforms on the Wherry lines are only long enough for 2 coaches which prevents the train carrying more passenger coaches, while the DVT is required for the guard. Two locos need to be used as the class 47's are not able to work in push/pull mode with the DVT and also to avoid time consuming run-rounds at each end of the journey. At approximately 350 tonnes for the five vehicles (unloaded) the short set weighs in considerably heavier than the 70 ton approximate weight of a two car class 156 (a typical DMU used on the route) and really a very inefficient train to run! It is unsurprising therefore that Greater Anglia try to keep use of the set to a minimum. It will only go out if there really is no other option and as soon as another DMU is ready off maintenance the set will usually be swapped out of traffic. While this may not be a great situation for the train operator it is great fun for the railway enthusiast! The photographs accompanying this story show the 'Short Set' in operation on Saturday (a very unusual occurrence in itself) 31st August, a day of particularly good weather and poor DMU availability in the area which lead to the train covering four return trips from Norwich to Great Yarmouth throughout the day. 47828 and 47841 were providing the motive power.